Manipal has a lot of universities, in fact it is a city full of students. The college festivals there are celebrated on a huge scale and have a lot of enthusiasm. The Manipal University approached Farhan’s band last year for their festival. However Farhan’s dates were already locked and he could not make it for the festival. The organizing committee was really disappointed and kept going to and fro with band team to try and figure a way that Farhan could attend the event. But things did not finally work out. However the enthusiastic college committee reached out to Farhan’s band immediately the next month and extended a proposal for him to perform next year at the festival. While the band told them that it won’t be possible for them to book so much in advance keeping in mind Farhan’s film dates, brand commitments and other things, the students insisted on making a tentative booking. They explained that they did not want to lose out on the opportunity of having Farhan perform. 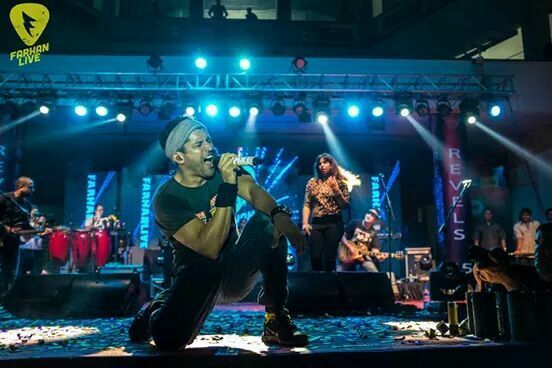 Farhan started his band ‘Farhan Live’ two years ago and since then they have been extensively touring for concerts. The band has performed in a lot of colleges and universities since they came together. Farhan has extensively been travelling across cities like Kochi, Bangalore, Hyderabad, Belagaum, Goa, Pune, etc. He performed in Manipal on March 14th and the students were all bursting with enthusiasm and vigour.